The Martin Yale SP100 score and perforating machine's fully adjustable paper guides move to accommodate 3-1/2" to 12" wide sheets of 24 lb. bond to 100 lb. cover stock (equivalent to 72 lb. bond). The score and perforating hubs are adjustable for easy setup. One 14-tooth perforating wheel and one scoring wheel come with the machine. The Martin Yale SP100 score and perforating machine is a great companion for any print operation, providing stand alone score and perforating capabilities. It creates tent style business cards, occasion cards, and tickets. The SP100 desktop score and perforater machine is a perfect addition to any quick print shop, classroom, small office, or store. The fully adjustable paper guides move to accommodate 3-1/2" to 12" wide sheets of 24 lb. bond to 100 lb. cover stock (equivalent to 72 lb. bond). The score and perforating hubs are adjustable for easy setup. 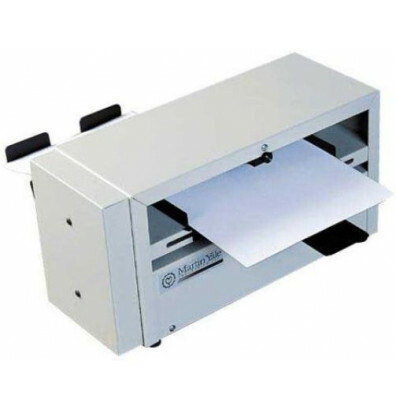 This hand-fed machine features a feed tray that can hold up to a 5/8" stack of paper. One 14-tooth perforating wheel and one scoring wheel come with the machine with additional perforating, scoring, and slitting wheels available. Additional perforate, score, and slit wheels are available - Please request a quote for more information. Additional 2-groove perforating guide rollers (model# WRADT1109) and stripper wire (model# M-ODT1126) are available under "Recommended Accessories" on the right-sidebar. Min. Sheet Size: 4-1/8" x 3-1/2"
Max. Sheet Size: 8-1/2" x 12"
It machine was operator friendly and even with the limit of only one perf and one score wheel I was able to produce a templet with of 27 size 7/8" x 3.5" tear offs for a fairly new customer. The price of this product was most reasonable through your company which has me considering further purchases from your company very soon. How many perforation wheels can be added to the machine? Four is the most you would want to add. After that it is hard to get the guide rollers to touch the paper as well as perforate.